If you're me, you get these! I'm a dork, I know. I'd been thinking about knitting and reading at the same time, and figured that this would be an awesome project to try with. Not to mention the fact that when I opened the package from Grace, it was all I could to to not wind it and knit with it right away. I already have more yarn from her on the way, its insanely well priced and great to work with. I love handspun but I don't spin and its usually out of my price range (rightfully so for what it is)... so I got to indulge a little and now have some rad gloves to stave off of the cold, rainy weather we've been having lately. Aside from the Night and Day gloves (which I knit with the Cole Porter tune in my head as well... not as bad as Blame Canada though :)) I managed to get down to the armhole shaping on Starsky... now just the length of the back to go. I'm so not impressed with the pics I take of the sock like this-- but when I try them on I love these socks already :) Ever wear the one sock around the house while the second is still on the needles? Yeah... uh. Yeah. I love Grace's yarn! I hope we don't start fighting over her stock as it appears!!! Your starsky is gorgeous! And I love the Night and Day wrist warmers - I've heard that they will be all-the-rage for fall fashions. 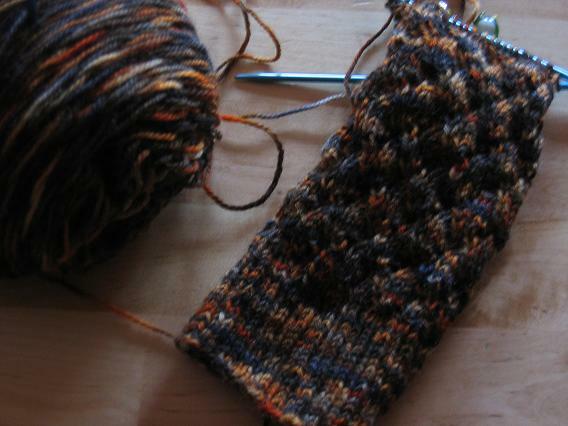 You left comment on my blog yesterday asking about my circulars that I'm using with the Kasula. I wasn't sure how to email you directly, so I hope that it is okay to leave comment here and you will get it (hopefully). I'm using 4.5 Rosewood Holtz & Steins. I love both the ebony and the rosewood - the rosewoods self-polish to an exquisite shine. And maybe I'm insane (okay, that's already been determined), but I LOVE the smell of the Kasula! (I've got two more skeins of it in different colorways). (let me know if you have any other questions about the Holtz & Steins). 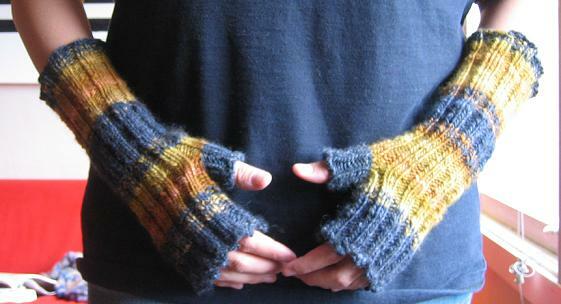 Love the arm warmers, they look great in that yarn. I love the colour you chose for your Starsky, it looks really rich and bold without being 'in your face'. It's looking fab so far. 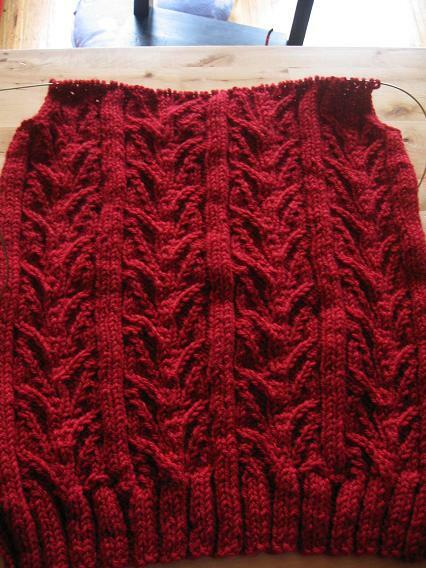 I'm hoping to start mine by the weekend if I can get the colour yarn I want. 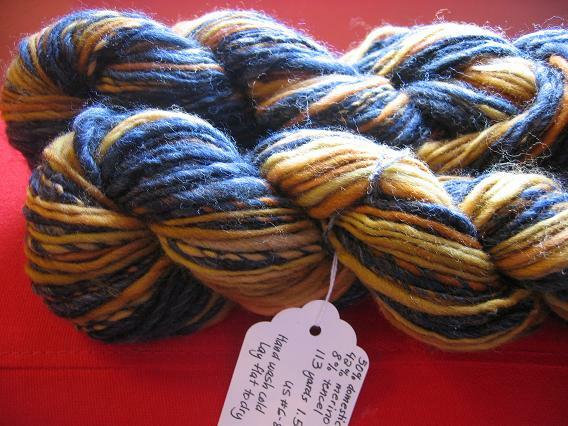 That is beautiful handspun - I love the color combination - I'll have to head over and check out her stuff! I like your mittens, they look very nice and cozy. Starsky is beautiful, the color you chose is so nice and rich. You have been busy! Love the wrist warmers! Maybe you will post your pattern someday? I finished your Carbon sock's twins yesterday, funny how mine didn't pool down the foot, I thought that looked cool. Thanks for offering to trade for the Waterlilly but I really do like it once I got use to the idea that it had the orange. I just have to think of a good pattern for it. I'll be interested in hearing how you like the Schaefer Anne, it is one I haven't tried but have been meaning too. Hi nice pictures.These types of woolen designs are required in winter season.Gloves and jackets are most preferred.